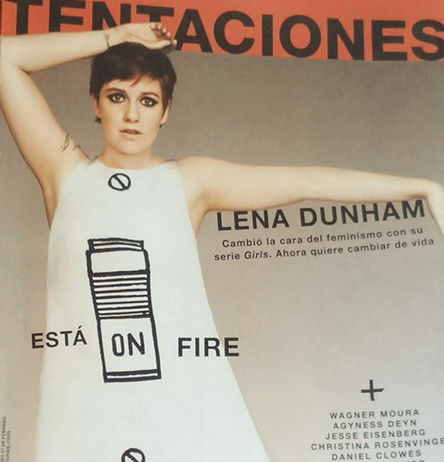 –Lena Dunham is not happy with her photo on the cover of Tentaciones, saying “this is NOT what my body has ever looked like or will ever look like- the magazine has done more than the average photoshop.” The mag claims they didn’t change anything. –Ben Affleck and Jennifer Garner were at the same Oscar party and somehow the universe didn’t implode. –Jen enjoyed a much less awkward reunion with her Spy Daddy. -Like the rest of civilization, Jennifer Lopez is sending a hard side-eye at Ben Affleck’s new back tattoo. -JLo also says she’s not feuding with Mariah Carey despite a decade worth of rumours about it. Do you remember interviews like this, when she used to slam everyone? God, the last few paragraphs on that page still give me life. -I’m gonna need someone to explain to my why Courteney Cox is in this picture, kthanxbye. –Sly Stallone‘s brother has apologized for that Twitter rant after his bro lost. –Mellie from Scandal is dating the Jeremy from The Mindy Project IRL. Weird but also awesome. -In case you missed our Oscars fashion recap, it’s here and it’s spectacular! -Is Taylor Swift dating Selena Gomez’s brother? Oh, this will end well. –Chris Martin will get around to Gwyneth Paltrow’s divorce papers soon. Maybe. If he feels like it. We’ll see. –Yvette Nicole Brown‘s second career as an official fangirl is pretty damn adorable. -If you haven’t watched John Oliver’s takedown of Donald Trump yet, it’s worth 21 minutes of your time. -Happy Endings alum Casey Wilson just landed a new sitcom, which makes me all kinds of giddy. –Tom Hiddleson is ready to pee on you if you get stung by a jellyfish, science be damned! –Spike Jonze convinced Stephen Colbert to try a new artsy opening — with a cameo by Grover.